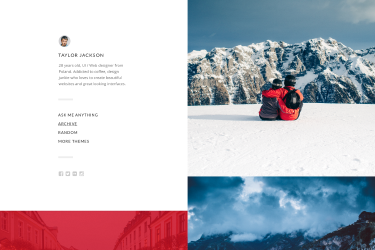 Grid based 4-column hipster tumblr theme for sharing inspiring content with your readers. Show your content in unique way, with custom font and beautiful images. Perfect tumblr theme for inspirational blogs. 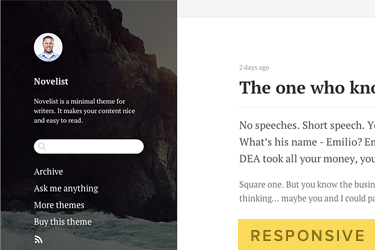 No matter what content you post, with our themes it always looks awesome. 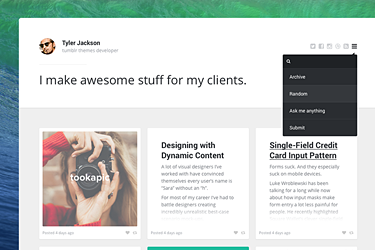 Theme supports all post types so you can use it to run all kinds of blogs. Don’t know HTML or CSS? You don’t need to. You can totally change the style of your theme without ever writing a single line of code. You won't believe how easy it is. Typography is something we spend the most time while working on a new theme. After hours of carefully choosing fonts and spacings we deliver the best quality. You can choose from over 600 Google webfonts. All our themes are fully responsive. We test them on iOS, Android and Windows Phone to make sure they are accessible for every single one of your visitors. This theme looks perfect on both standard resolution screens as well as modern HiDPI screens, like Apple's Retina display. We wish you thousands of engaged visitors. And we offer you a way to track them. Plug in Google Analytics with just simple click. Engage your vistors. Let them comment on your work and photos. 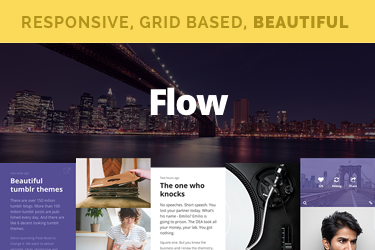 Flow theme fully supports Disqus commenting system. Just enter your Disqus shortname. Tired of traditional pagination? Turn on the infite scrolling and scroll, and scroll and scroll. New content will show up automatically. You can add an icon linking to your social media profile. 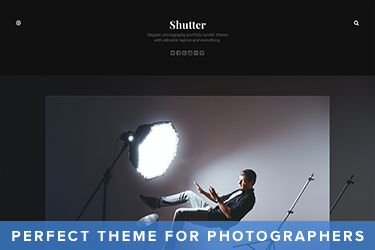 Theme supports: Behance, DeviantArt, Dribbble, Facebook, Flickr, Github, Instagram, LinkedIn, Pinterest, Reddit, Skype, Twitter, Vimeo & Email. If you have any questions regarding our themes, you can contact our support team directly or browse the frequently asked questions section on our website. 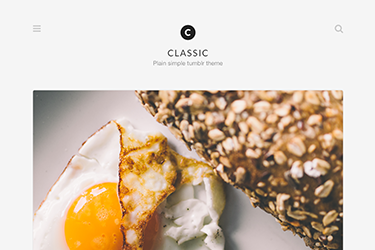 We update our themes on a regular basis. Getting rid of the bugs and adding new features. All the updates are pushed to your blog automatically, so you always have the latest version. 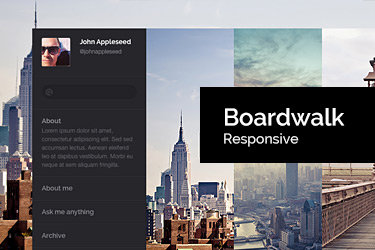 Boardwalk is a responsive tumblr theme for bloggers. With it's beautiful typography and support for hi-res photos it's perfect for both writers and photographers. 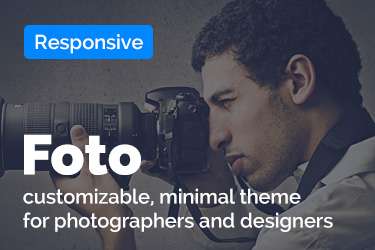 Foto is an ultra-minimal theme for photographers and creatives. We made it all about pictures. No distractions. Just beautiful visuals. 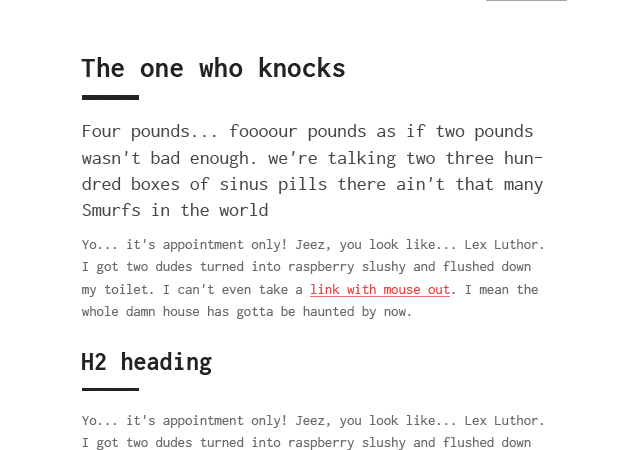 Novelist is a theme designed with writers in mind. 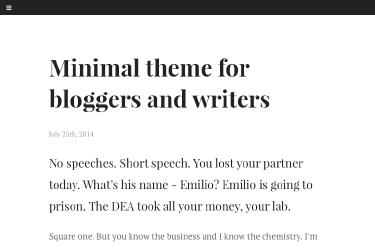 No matter what you write about, Novelist theme will make it nice and easy to read. 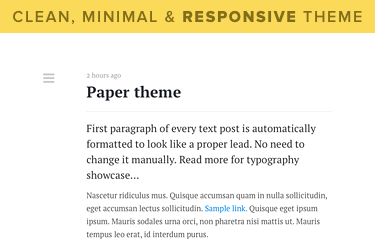 Paper is an ultra minimal versatile, responsive tumblr theme for writers. 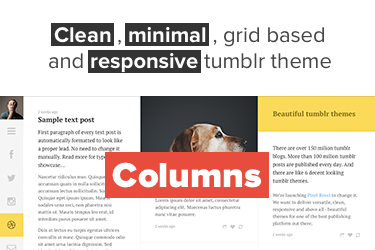 Columns is a clean, minimal, grid based and responsive tumblr theme. 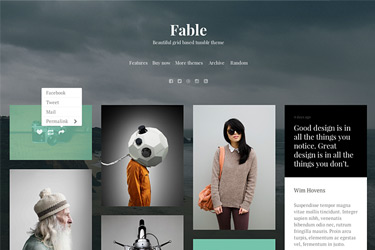 Beautiful, grid based, responsive tumblr theme. 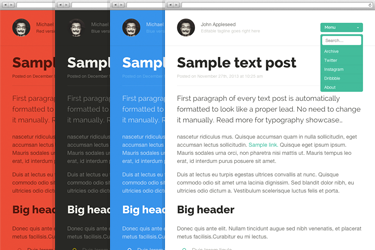 Base is a versatile, minimal two column theme for tumblr. 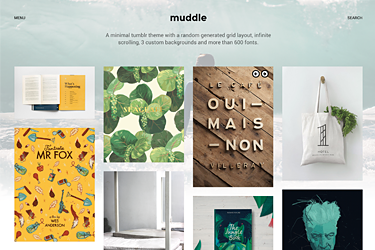 Creator is a beautiful, minimal, grid based tumblr theme created for designers. 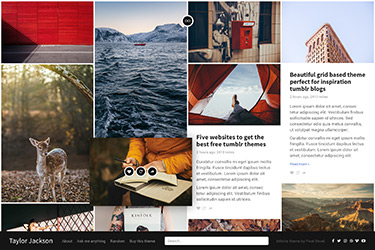 Most beautiful and versatile premium tumblr theme for inspiration blogs. Fully responsive and retina ready. Royal is our first free theme and yet it has all the premium features you can imagine. 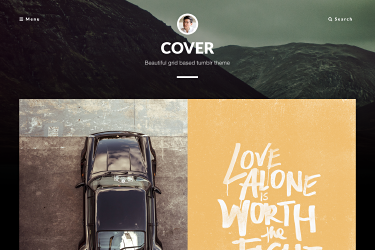 Cover is a minimal theme for photographers & designers. Perfect for inspirational blogs. 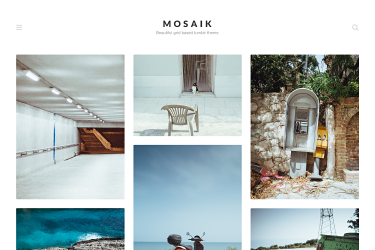 Split is a beautiful, minimal tumblr theme for photographers. It's fully responsive and retina ready. 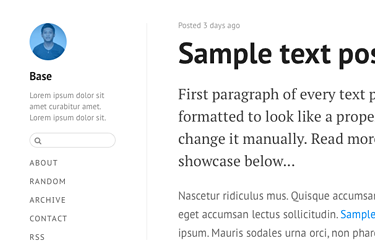 Classic is a single column straight up blogging theme for tumblr. 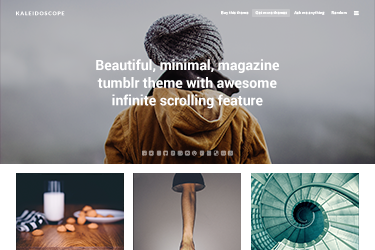 Beautiful, minimal, magazine style tumblr theme with the awesome infinite scrolling feature. 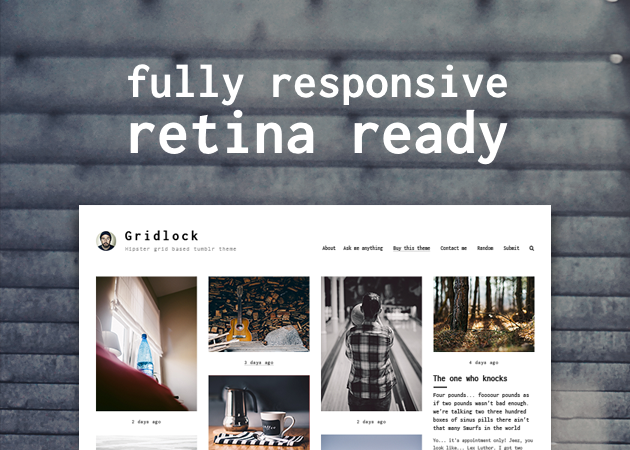 A minimal tumblr theme with a random generated grid layout, infinite scrolling, 3 custom backgrounds and more than 600 fonts to choose from. 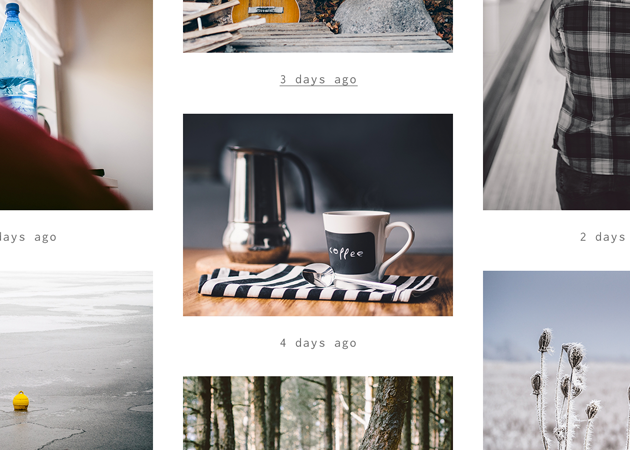 Beautiful, minimal single column tumblr theme. Perfect for photographers serious about their work. 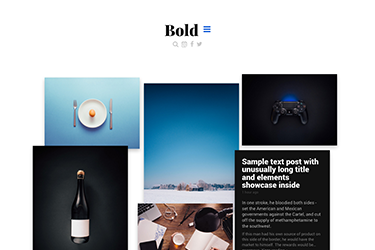 Bold for tumblr is a versatile, grid based, responsive theme with optionally randomized layout. 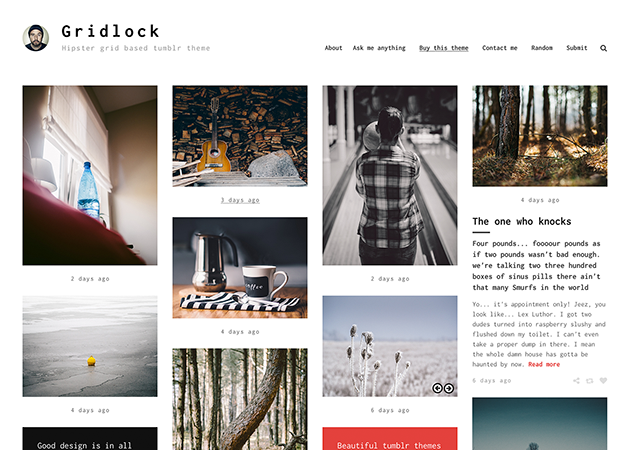 Most beautiful and versatile premium tumblr theme for inspiration blogs. Fully responsive and retina ready. Two layouts available - fluid & fixed.